On August 6, 1997, during a non-precision approach to runway 06 left at A. B. 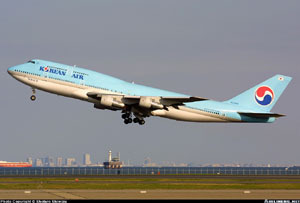 Won Guam International Airport, Korean Airlines Flight 801 crashed at Nimitz Hill. Nimitz Hill is approximately three miles southwest of the airport, which is located at Agana, Guam. The airplane crashed into high terrain while conducting a non-precision approach. Of the 254 persons on board, 228 were killed. Twenty-three passengers and three flight attendants survived with serious injuries. The airplane was completely destroyed by impact forces and post-crash fire. The National Transportation Safety Board (NTSB) determined that the probable cause of this controlled flight into terrain (CFIT) accident was the captain's failure to adequately brief and execute the non-precision approach and the first officer's and flight engineer's failure to effectively monitor and cross-check the captain's execution of the approach. Contributing to these failures were the captain's fatigue and Korean Air's inadequate flight crew training. Contributing to the accident was the Federal Aviation Administration's (FAA) inhibition, due to reliability concerns, of the minimum safe altitude warning system (MSAW) at Guam.